Kauto Star and Denman are set to meet each other for a third time in the totesport Cheltenham Gold Cup on Friday, March 19. Currently the score stands at one all between the two Paul Nicholls-trained superstars, with Denman having got the better of his stablemate in the 2008 renewal of The Festival's feature, only for Kauto Star to reverse the placings last year and become the first horse to regain chasing's Blue Riband, having recorded his initial totesport Cheltenham Gold Cup success in 2007. Clive Smith, owner of Kauto Star and Harry Findlay, part-owner of Denman, were present at a totesport-organised press event in London on Thursday and gave their thoughts ahead of Friday's contest. Clive Smith said "Kauto Star is sparkling at the moment on the gallops and Paul (Nicholls) and Clifford Baker couldn't be more pleased. I've as much respect for Denman as anybody and believe the mishap at Newbury is in the past, he will better for that race and Paul will have him spot on for Friday so we've got some serious opposition on the day. "I've got great admiration for Tony McCoy, as anybody would, and he won the Cathcart for me on Royal Auclair. I think Tony will ride Denman brilliantly on the day so he's going to be a formidable opponent. "I've been asked several times what it feels like to watch Kauto Star and it is the first couple of fences that are the worry, once he gets over those he's fine and then he strides away and jumps very impressively. He's done that every time at Kempton Park. "Obviously there's always race riding to think about, it's like the rub of the green at golf, so I never could say I'm not worried but I have a lot of confidence in Kauto Star. "I think Denman was terrific in 2008 and the only possible thing you could mention was how close Neptune Collonges was to Kauto Star that time. Kauto Star should have beaten Neptune Collonges by 10-12 lengths and he just beat him by a short-head. That's the only reason you could think Kauto wasn't up to his best then. "He'd had the injury at Ascot that year when he had pus in his foot and he'd been up that night and maybe that had some effect. He had a couple of days off the gallops but that would have happened anyway after a race. "Just because I appear relaxed doesn't mean I'm not excited. When I've thought about it, I think that it was only after the race I realised how thrilled and uptight and excited I really was. It was only when I relaxed afterwards that I realised. "Any owner worth his salt likes to have a bet on his own horse. I use Betfair, which I think is fantastic. I thought 7/4 was a fantastic price last year but 8/11 is a bit tight this time. I just dribble a bit of money on in the months leading up and then I might have a big bet on the day. "I just want the horse to win it for himself and be rated as highly as he can. He's up there with the best and has great qualities that certain horses didn't have. He's won at two miles and got great speed. He's very brave as I suppose all champions are. "We'll see at the end of the career where he stands but he has to be close to the best. He's got certain qualities that Arkle didn't have, his speed and the fact that he won at two miles. But they are like golfers; it's very difficult to compare champions from different generations. "I saw Arkle race many times at the races. He was terrific and I was full of admiration for him but I think Kauto is close to him now. "One of the great things in the last couple of years is that Ruby (Walsh) has worked Kauto to the nth degree and got better and better on him. I think that's brought two to three lengths improvement in him." Harry Findlay said: "The year Denman won, there was no great pace there in the early stages and he just stepped it and stepped it up and that's what won us the race. "He's a Jack the lad. On Thursday morning, when he was schooling with Tony McCoy everything else went where they should but not him. He shirked and cajoled but that's just him. "Paul does a great job with all his horses but to have trained Denman all that time and keep him sweet is a fine art because he is a bit of a lad. He takes a bit of looking after. "I didn't fancy him in the first mile of the Hennessy this season but he loved the latter part of the race. At the last fence he was giving two stone to What A Friend, who did nothing wrong, but Denman gained two lengths. That just doesn't happen. "Then people say he was beaten when he made his first mistake at Newbury in the AON Chase but he was far from beat. "We did try the blinkers but they didn't go too well. I hope the Gold Cup gets him in the mood and I have to say I haven't even thought about winning it after what happened to him at Aintree last year. "But for everyone else I hope he shows up and runs his race at Cheltenham and if he was beaten three lengths by Kauto Star I'd be happy. I'd just be gutted if Denman doesn't show up but he was a nine out of 10 when I saw him on Thursday morning. "Tony McCoy told me straight after he won his Gold Cup to be careful because he thought that race would have made a big mark on him. Talking to him on Thursday, I half got the impression he still thought that. "We've also got the ground to worry about this year. At least in 2008 we had nice sticky ground which they called good to soft but was softer than that. This year, if we play into Kauto's hands on this ground, I can only see one result. "It's lovely to have Carruthers in the race because he can make the running and there are a couple of others as well including maybe Imperial Commander. The only place to go is in the middle of the race to attack. "I make my living out of my judgement but I've never sat on a racehorse so I don't say too much about jockeys but Tony's a great jockey and I think he'll suit us. I've always been a massive McCoy fan. "Ruby's just a different style and you can't fail to be astonished how skilful he is, especially when he's schooling at home. "I stuck up for Sam (Thomas) last season and got him the ride at Aintree, which went against the head. "But with Sam not being so directly involved with Nicholls this year I always thought Tony would get the call. I left it primarily to the Pauls (Barber and Nicholls), knowing that it was probably going to be McCoy, Sam Thomas or Christian Williams that rode Denman and I wasn't bothered which one. The jockey was never an issue to me. Sam's done it all before and suited Denman well, Christian handled the horse well and is unbeaten on him and McCoy's a legend. "I think Paul Barber's been sniffing around for McCoy to ride Denman before. Last year Denman had his problems and the year before Tony McCoy had an injury prior to The Festival so I don't think it's the first time they've been in contact. "Barber's also always been mad for Ruby and I think in the back of his mind always hoped that he'd get off Kauto, but he won't. "I think Paul (Nicholls) is already talking about Kauto for next year and there has to be a good chance they can meet again. There was always going to be nothing coming through this year, it was a nothing RSA Chase last season, but there are at least three coming through for next year and I'd love to see that as a racing fan. "There's a few like Long Run and Mikael D'Haguenet that could shake the market up. "There was plenty of 1.78 Kauto on Wednesday night (on Betfair) and that was a good price. I don't believe in insurance, my house isn't insured, but when you've got a horse that can win £200,000 in prize money and give you a great buzz if it's successful then you can back the other horse. If Kauto's 1.78 next Friday, then I'll be taking that. "We haven't discussed tactics to any degree yet but will do before the race. Last year's race was a time trial and we knew we couldn't be too aggressive with Denman; it looked like we wouldn't be running him a week before the race. "Everyone knows Kauto is Nicholls' favourite horse. It annoys Paul Barber a bit but doesn't bother me at all. "I'm a dog man and I know how I'd feel if I trained dogs who had done what they had done and had them in my kennel. If I was the trainer not the owner then I'd want Kauto Star to win the Gold Cup so I don't blame Paul at all. "I just think that as a trainer your champion, the best you've had, is very special and I understand that. Even if we beat Kauto Star on Friday it doesn't make us the governor, because it's three and a quarter miles around Cheltenham which I think is slightly in our favour. "Paul Nicholls thinks I'm completely mad to say that but I think the only chink in Kauto's armour is whether he gets three and a quarter miles round Cheltenham in a true run race. We all talk about winning the Tingle Creek over two miles but he didn't just win it, he won it after four fences. It was all over by the Railway Fences. "I've also never seen him more impressive in terms of the speed he jumps than at Kempton over Christmas. "He had five races before he won the Gold Cup but he's only had two races this year. We're going to have to beat the best ever Kauto Star this year. From last year Nicholls has had one job to do and that's to win another Gold Cup. Kauto Star is so fresh and so well that it will take an enormous performance to beat him. I just hope we're in contention two out. "I never think Kauto gets the respect he deserves and one of the reasons I make a living is that people don't like the champions. If you took away the money I'd made from the likes of Federer, Woods, Kauto, Denman, Eric Bristow and Steve Davis then you'd have a loser. "I was in Australia when Kauto Star won the King George and 8/11 was a great price. If he'd have got beaten that day then I wouldn't have a pot to piss in now. You do get great value on the champions in this country, there's a percentage of people who love to get them beat and I love those people. 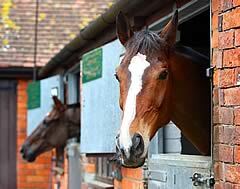 "I've seen all the horses since 1978 onwards and Kauto is the best three-mile plus chaser since then. I'd only have Kauto 5-6lb behind Arkle on what I've seen. "In 2008 turning in we were going to beat Kauto by 30 lengths until we hit the second last. That race had to leave its mark because as he turned Denman wasn't stopping but then stopped when he hit the second last but won by seven lengths. I think we were 30 seconds away from something really special that day, something obscene. He was on fire that day. "I'm gutted for the press that we didn't win at Newbury last time and then we'd have had a real match."